It seems that the world has quite literally gone avocado mad. But I am not complaining… I LOVE them – although I am currently a bit ‘over’ avo toast. I needed to find a new carbohydrate to smother with the fleshy green goodness, and what’s better than pasta? So, I came up with this: avocado pesto pasta with roasted tomatoes and pine nuts. And let me tell you, it tastes just as good as it sounds. In the last 5 years the avocado industry has boomed with sales up 184%. Every man and their dog are raving about how good it is for you – and they aren’t wrong! One avocado contains four grams of protein, the highest protein content of any fruit (yes, it’s a fruit! ), as well as containing more potassium than bananas. 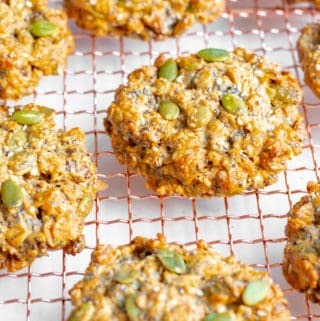 They are also a great option for anyone watching their waist-line as they are full of heart-healthy monounsaturated fats and fibre – both of which keep you feeling fuller for longer. 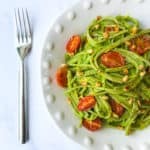 This avocado pesto pasta is loved by meat-eaters and vegans alike and is so beautifully creamy you won’t even realise it doesn’t contain dairy. Usually if I have any leftover sauce I store it in the fridge and use it the next day as an utterly delicious salad dressing or dip, but it’s so versatile you can dollop it on anything your heart desires. 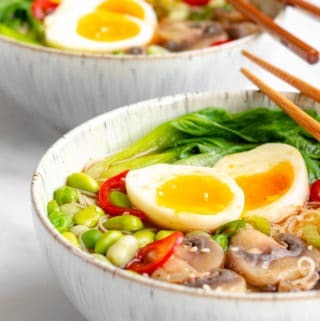 This is such brilliant, tasty and uber quick mid-week supper that will leave you feeling rather chuffed with yourself. 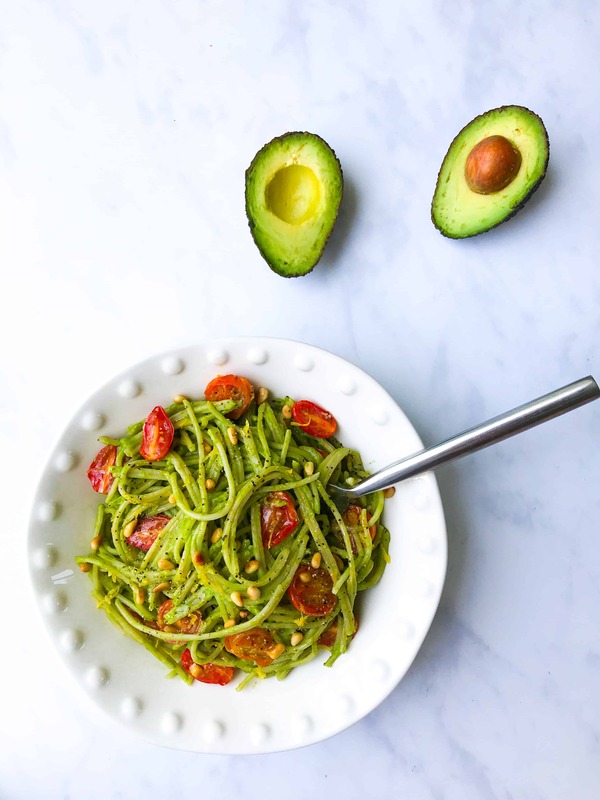 Whether you are feeding crowds or just yourself my avocado pesto pasta is sure to become a new favourite. 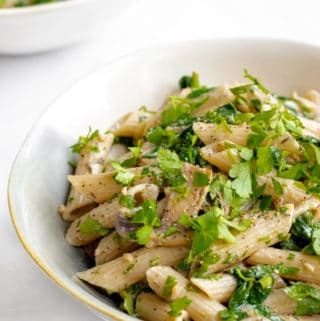 To keep this dish extra nutritious I would recommend using a brown-rice or at least a whole-wheat pasta rather than a refined white pasta – the nutty taste works great in this dish and your body will thank you for it! 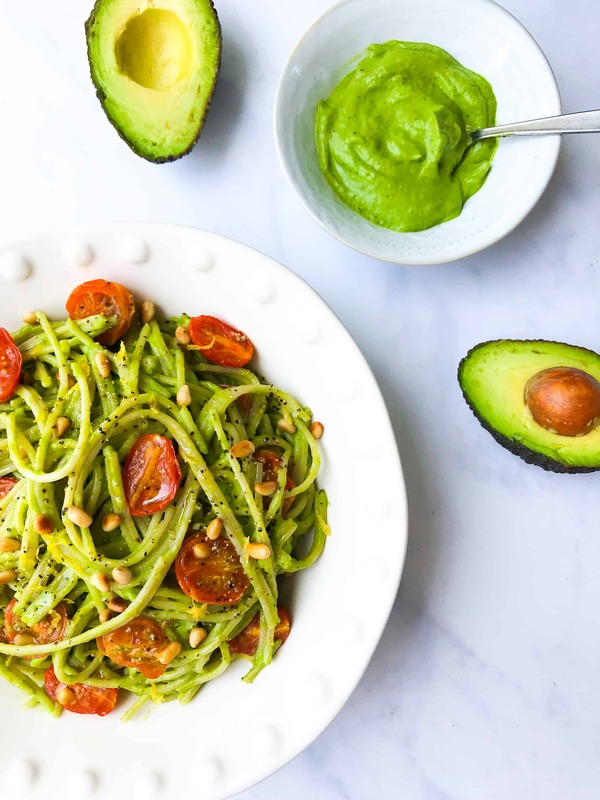 If you love avocados as much as I do and decide to make this avocado pesto pasta, please let me know by sending me a picture on IG @georgieeatsuk, or leaving me a comment down below – let’s have a chat! 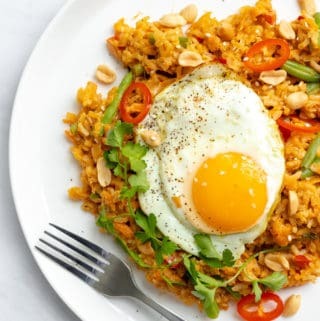 A super quick delicious and nutritious weeknight dinner than you can whip up in less than 25 minutes. Beautifully creamy yet light avocado sauce with sweet roasted plum tomatoes and crunchy toasted pine nuts. 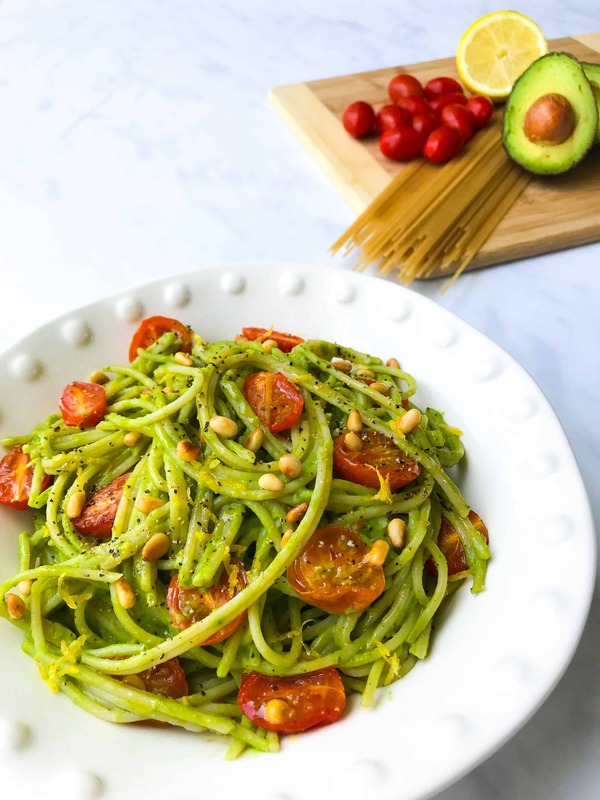 Loved equally by both vegans and meat-eaters this avocado pesto pasta is sure to become a new favourite. Add all the pesto ingredients into a food processor and blend until smooth. Taste and adjust the seasoning if needed. If your blender is having trouble here you can add a little more water to loosen the sauce. Place the tomatoes onto a baking sheet with the cut side up and place under the grill for 10 minutes until soft and slightly charred. Meanwhile bring a pan of salted water to a boil and add the pasta. Lower the heat slightly and cook for the time indicated on the packet (mine was 7-8 minutes) until tender. Drain and return to the sauce pan. 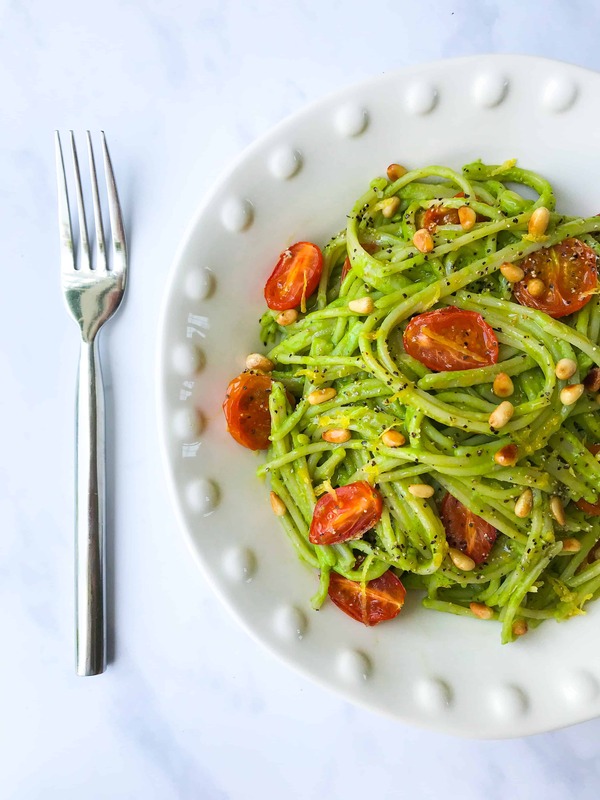 To assemble, place 1/2 of the pesto (you can adjust this amount according to how much sauce you like), 3/4 of the tomatoes and 1/2 of the toasted pine nuts into the pan with the drained pasta. Stir well. Divide the pasta between two bowls before garnishing with the remaining tomatoes and pine nuts. This avocado pesto pasta is great warm or cold and makes a brilliant packed lunch. Just allow the pasta to completely cool before refrigerating. Personally I would avoid using refined white pasta where possible. For this recipe I like using brown rice pasta, but great alternatives would be spelt, buckwheat or wholewheat pasta. If you are using spaghetti as I have done, allow 100g of pasta per person. If you are using fresh pasta, allow 110g per person. To toast your pine nut, gently fry them in a dry pan over a medium heat for a 2-3 minutes until golden brown. Be really careful not to burn them and watch them at all times!! I like to make a double quantity of the avocado pesto and keep some of it in the fridge to dollop on all sort of things! You can store it in an airtight container for up to 3 days. 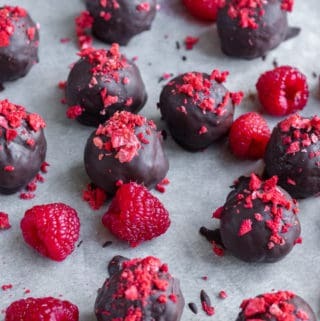 oh, how delicious! i haven’t incorporated avocado into any pasta dishes, but i’m sure i’d love it! You really have to try it, its quite something!